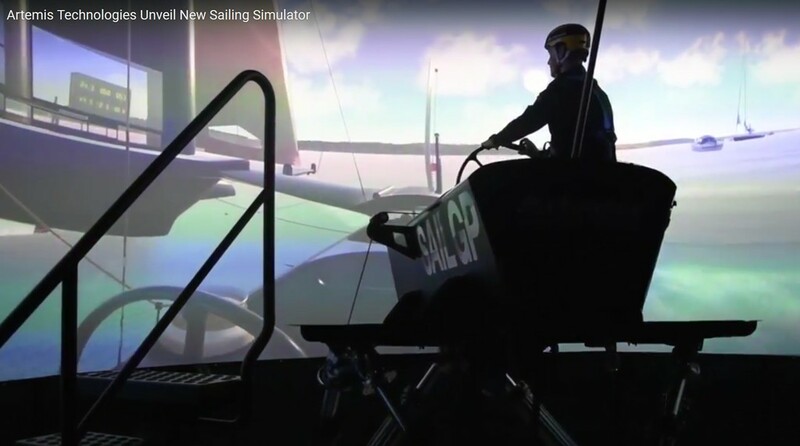 Artemis Technologies has unveiled the company’s latest piece of ground breaking technology, a new full-motion sailing simulator. The 4.5 metre high, 210 degree screen, which conveys images from three laser phosphor projectors, is wrapped around a physical platform similar to those used for flight and motorsport simulators, providing an incredibly immersive experience. The simulator has two key functions, crew training and boat development, and is currently optimised for SailGP using an identical cockpit to the new F50 high-performance catamarans. The new SailGP teams have each been given three days to learn how to sail the new foiling catamarans, in “real-time”, ahead of the circuit beginning early next year. “It is incredible,” commented Billy Besson, helmsman for the France SailGP team. “This is allowing us to get a feel for a new boat in a way that hasn’t been possible before”. Based at Artemis Technologies facility near Heathrow airport, the new simulator has been developed over the last 12 months, and is a continuation of the work undertaken by Artemis Racing during the last America’s Cup.